Red, green, and blue (RGB) are the primary colors of light. Cyan, magenta, yellow and black (CMYK) are the primary colors of printing. RGB color is used to display on your computer screen. RGB is called additive color. The more light you add the lighter your color becomes. When equal amounts of the RGB primary colors are at their highest level, the resulting color is white. CMYK color is used for printing. Dots of ink are printed on paper for each color: cyan, magenta, yellow and black. The more ink on the paper the darker the colors become. CMYK is called subtractive color because each color subtracts (absorbs) some wavelengths of light. So the more ink, the less light is reflected back from the paper. RGB is able to display colors on screen that are not possible to create in CMYK. A printed color proof will more accurately show the color of your printed piece. Monitor calibration software can help your screen more accurately approximate the printed result. 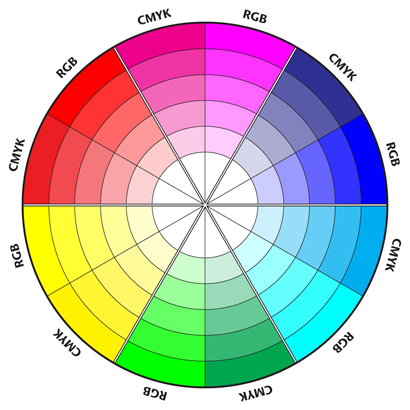 This color wheel shows a simulation of the difference between RGB and CMYK colors.